As evenings grow shorter and cool winds disperse the last perfumes of summer, I’m reminded The Ozone House dinner, “An Evening at the Farmers Market,” is just around the corner. The open-air feast will be held this year on Friday, Sept. 7 at 6 p.m., served beneath lights strung high above tables set with wildflowers, picked that morning at Tantre Farms. Last year more than 90 people volunteered their time to ensure the Ozone House fundraiser was a success.This fifth annual fundraising event, which includes live entertainment and a silent auction, celebrates the contribution Ozone House has made to our community. It also applauds the generous chefs and local businesses who contribute their time and resources insuring the event is a success. Ozone House is a shelter and support system for homeless and high-risk youth who don’t have a safe place to call home. Last September, Ozone House event planners welcomed more than 300 guests and 90 volunteers, raising more than $70,000 to support invaluable services to kids who have no where else to turn. And there’s the menu; oh yes, let’s not forget that scrumptious menu, which elevates this fundraiser to a culinary happening. As in past years, the main courses will be orchestrated by Kerrytown chefs and business owners, Mike Monahan and Bob Sparrow. 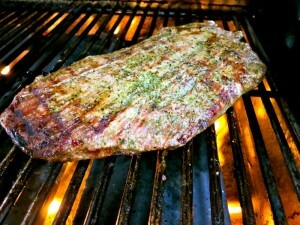 Staff from Monahan’s Seafood will be preparing Grilled Great Lakes Trout with Tarragon Aoili, and Sparrow Meats will serve Grilled Tuscan Flank Steak, the recipe for which he shared with us, and I recreated in my kitchen. 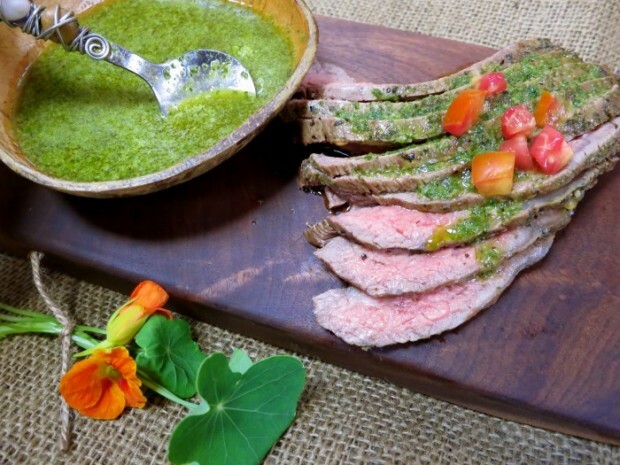 The lean beef’s earthy sauce of citrus and oregano flavors also remind me of chimmichurri, a classic South American preparation of grilled beef topped with an oregano-parsley sauce. Chef Alex Young, of Zingerman’s Roadhouse, will prepare a side dish of Potatoes Au Gratin made with Gruyere cheese, a luscious complement to the entrées. Roasted Carrots will also be a part of his contribution, the vegetables harvested from nearby Cornman Farms, an operation expanded this summer with the purchase of adjacent land. Two new jewels were recently embedded into the crown of Ypsilanti’s restaurant scene, and both eateries are showing their commitment to Ozone House with their additions to the feast. Barbara Marcotte and Annette Weathers of Bona Sera Café are preparing the appetizers, one of which is a Deconstructed Crab Roll, and Bee Roll of Beezy’s Café in Ypsilanti is creating a salad. Guests will be delighted with a new addition to the fundraiser’s repertoire. Decadent Delight’s, Bryant Stuckey, will architect a dessert bar featuring Creme Brulee Fruit Tarlet, Decadent Chocolate Squares with Ganache and Cheesecake Squares. But wait; the celebratory libations! An Inaugural Signature Cocktail, created by Eric Farrell from “The Bar” at Braun Court, will be comprised of pisco (a Brazilian liquor similar to rum), lime juice and blueberry syrup. Everyday Wines at Kerrytown Market Shops insures there will be appropriate wine to complement your dinner, and Arbor Brewing Company will provide a selection of beer. Hot and Iced Tea by TeaHaus, fresh brewed coffee by Mighty Good Coffee Roasting Co. and water by Arbor Springs round out the selection of beverages. I’ve attended this event since its inception and, trust me, memories from past dinners should guarantee another sell-out crowd from a returning community of Ozone House supporters and food-loving participants. You, too, can toast the end of summer, and celebrate our community, which supports non-profits such as Ozone House, while dining on an elegant repast set beneath the stars. Tickets are $135 per person, $100 of which is tax-deductible, but you’d best not dilly-dally — tickets are selling fast. To reserve a seat, contact Sue at sdvorak@ozonehouse.org or at 734.662.2265 x 26. In a food processor or blender, pulse garlic. Add olive oil, lemon juice, vinegar, paprika, parsley and oregano. Pulse until well-blended but not puréed. Season to taste with kosher salt and freshly ground pepper. You should have approximately 1 and 1/2 cups marinade. Place half of the marinade in a large resealable plastic bag or shallow dish. Reserve remaining to sauce the cooked beef. Marinate beef 12-18 hours, turning once, refrigerated. Allow meat to come to room temperature and preheat charcoal or gas grill to high heat. Brush off excess marinade, season meat with kosher salt and freshly ground pepper, and place on oiled grill grate. Grill 6-10 minutes on each side (internal temperature of 135 degrees for medium rare steak), depending on heat of the grill and thickness of the beef. Remove the steaks from the grill. Let sit 5-10 minutes then slice against the grain with a very sharp knife. Drizzle reserved sauce over sliced steak. serve garnished with diced tomato, if using.